At 11am on the morning of the 5th April 2019- I woke up with a good vibe. This was because I was going to a stadium, that I had never visited before- Craven Cottage. It was even better as I was going to watch my local club- Reading U23s play. This was going to be the first time in my life so far that I was going to watch a Reading U23s game. They took on Fulham U23s at the Cottage at 7pm (UK time). The level of the game was raised, as we received off the record news before the game that Alfie Mawson was set to play for Fulham. So seeing a first team player in an under 23’s game made it even more exciting. However we were in for a more surprises, as Mawson wasn’t the only first team player that played in tonight’s game! But before that, we had to travel all the way from Cheltenham to London, and the coach trip was really fun and smooth. So that made the day even better before watching the game. After a long journey, filled with traffic (which was no surprise to me due to the fact that we were travelling to London) we arrived at Craven Cottage at around 5pm (UK time). From the Coach, seeing the Cottage for the first time was amazing. I loved the fact that the stadium had the old and vintage feel to it. Alot of stadiums nowadays are very modern looking, however this stadium had a lovely historic feel to it. The Cottage itself was beautiful. It was amazing to see a stadium that was built around a Cottage! The Funniest moment of my day was telling my friend (John Townley) that Fulham is one of the only clubs in England to have a stand for neutral fans! I revealed this to him once he saw the sign for neutral fans- he was so confused! The next sight that I saw as we were walking to reception to collect our press passes was the famous Johnny Haynes statue outside the Johnny Haynes stand. Initially I had no idea who this person was. But doing my research has led me to find out that he was regarded as Fulham’s best ever player. He was well known for his passing skill, and ability to read a game. And he was known as Fulham through and through, as he stayed at the club for 18 years! Unfortunately he isn’t alive anymore, but his legacy will be remembered well by the older generation of Fulham fans. 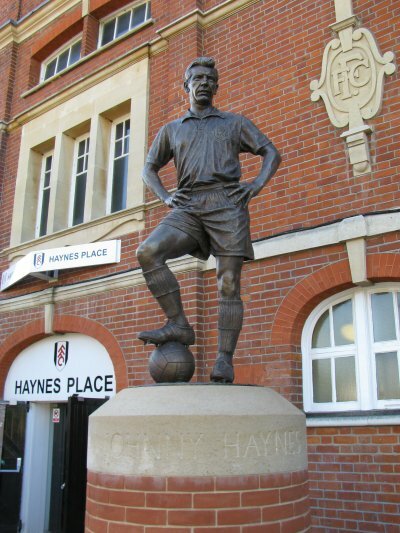 And his Statue, means that he will always be remembered by every Fulham fan. 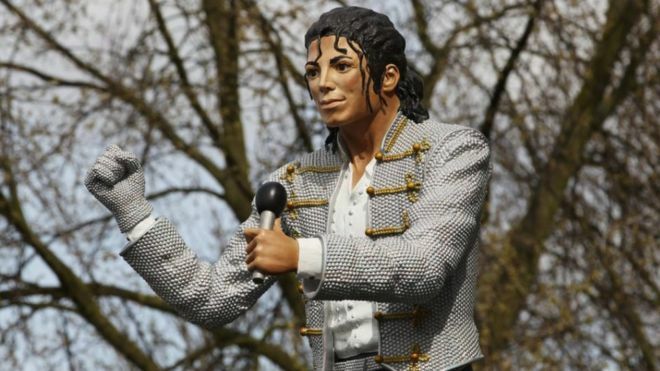 It was nice to see that Fulham actually had a statue with sentimental sense, after their disaster with the Michael Jackson statue! The worst part of the day came shortly after seeing the iconic Johnny Haynes statue. This was because we had to wait as very long time for all our press passes to be printed out. It was made even worse by the fact that it was very cold- meaning that we had to wait 10-20 minutes outside the Fulham reception in the cold weather. Another negative of waiting this long was that It made me want to just go to my home (Stamford Bridge), which was just around the corner! The only positive about waiting this long time for our press passes, was the fact that it allowed me to properly observe what was around me. It was amazing to see all the runners who were passing us as we were waiting. Obviously, it looked like Craven Cottage is a runner friendly place for runners to conduct their daily exercise. Another thing I properly noticed whilst looking around me outside the Cottage was the fact that the stadium was just outside a housing estate. So it differs from Brentford’s current stadium (Griffin park) because Griffin park is in the middle of a housing estate, whilst Craven Cottage is just outside one. Once we obtained our press passes, we had our first glance at the press conference room, and the pitch itself! The press room was a decent size for a Premier League club. Whilst observing what was around the press room, me and Hannah found an old Fulham team sheet. And it had to be from the Liverpool game! Luckily for Hannah, she was able to keep it as souvenir. Once we were able to go in the press box at around 5:45-5:50pm, my life nearly ended! This was because as I was walking up to the steps that led to the press box, the sprinklers turned on right next to me and nearly gave me a heart attack. My heart skipped a beat, but luckily nothing drastic happened. It would have been great if Hannah or someone behind me were able to record that moment as it was comedy gold! Once we settled into the press box, there were about 10 minutes before official team news was able to come out. In that time, I got my line up tweet ready for to publish for 6pm (UK time). I also had to get my updated preview ready to publish as Alfie Mawson started to all of our delights, as most people did a preview based on that off the record news given to us a day before the match! Once teams were announced, warm ups got underway, and it was nice just to watch the warm ups for a good hour. Especially Reading U23s in their shooting practice as they looked very sharp. From seeing them in the warm up, I knew that they were going to score at least one goal today. Fulham warmed up in Kick it out t-shirts, and that was lovely to see them support that amazing initiative to try and kick racism out of the game, which should have happened already, but there are still a few issues in England around racism in football. Luckily it’s not as bad compared to the likes of Montenegro and Italy. Here are some other examples plus the two teams coming out for kickoff. Into the game now, and Reading started so brightly and won a penalty early on, after Ben House was wiped out by Fulham goalkeeper Luca Ashby-Hammond. Baldock converted the penalty on his return from injury to make it 1-0 to Reading U23s. They soon made it 2-0 in the 17th minute, when Teddy Howe’s through ball found the run of Been House, who slotted past the onrushing Ashby-Hammond. Fulham U23s grew into the half, and had two chances to pull one back through Neeskens Kebano (another first team player who played), but Jaakkola saved his two shots well. Into the second half, and both teams had chances to score, but no one was able to add to the scoreline until the dying moments of the game, when Reading substitute Tyler Frost slotted the ball past Ashby-Hammond to make it a more convincing win for Scott Marshall’s side, as Reading U23s ran out 3-0 winners to my delight. During the game, we had to start constructing a 200 word BBC style match report, which had to be published on our blogs, and sent to our lecturer- Jon Palmer on the whistle, or a few minutes after the whistle. And I was doing ok, until Reading scored their final goal, as that I meant that I had to change some of my match report in the last minute. Thankfully, I didn’t get too flustered as I managed to get my report submitted before the deadline. 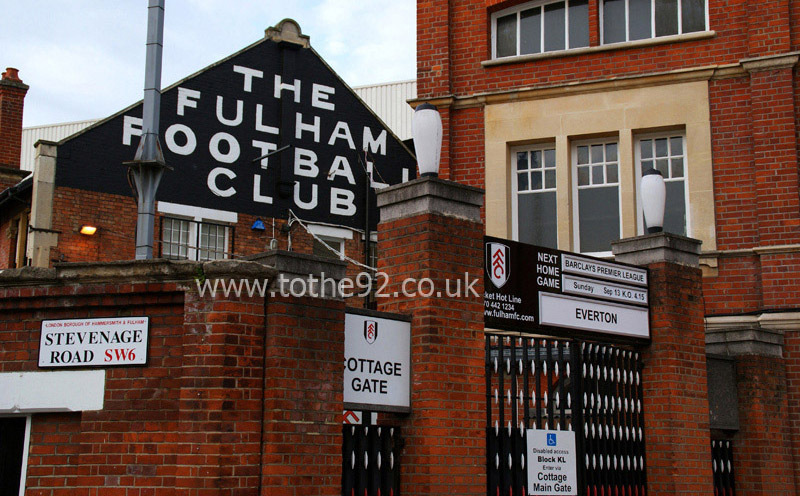 After that panic, it was time to go to the press room, and listen to Fulham U23s player: Matt O’Reily, and Fulham Media assistant: Adam Micklewright- who graduated from the Sports Journalism course at the University of Gloucestershire. As I entered the press room early with Hannah- we decided to sit at the back of the press room to watch the conclusion of Southampton vs Liverpool. I choose to sit at the back due to the fact that Hannah was so nervous going into the last 15 minutes of that game. Luckily, goals from Salah and Henderson calmed Hannah’s nerves, and that meant we could enjoy the press conference. First up was Matt Matt O’Reily, and it was good to hear how ambitious he was for his own future. It was also interesting hear about his good relationship with Scott Parker, and the fact that he believed that Fulham being relegated from the Premier League didn’t affect his sides performance tonight. Next up with Adam Mickelwright, and he was a delight to listen too. He spoke so well about his time at uni, and gave us so much advice. But the thing I took the most, was how glowing he was of what the course taught him. He stated that the course taught him everything for the job except one thing…. PR (Public relations skills). But when I later clarified with Jon Palmer, he said that the course has evolved since, and next year we have a topic about PR! So it is good to see the course I love develop as the Industry develops. Thank you @BASportsJourno and @JonPalmerSport for letting us have this opportunity to cover Fulham U23s vs Reading U23s at Craven Cottage tonight. The Coach trip back was fun- listening to people chanting and singing at the back of the coach, and having good conversations with Hannah and Jon Palmer. We got back just after midnight! But I would like to say that from every trip so far, I feel like I am developing new skills each time, and overall I feel like I am developing as a Sports Journalist who will be ready to get a job as either a media assistant at a football club, or a broadcaster for TV or radio.